PACKAGING NOT GUARANTEED TO BE IN MINT CONDITION. NOT MINT ITEMS MAY SELL OUT AT ANY TIME. ORDERS MAY NOT BE FILLED. Metroplex' nemesis has arrived! The big Decepticon is here, and this titanic T-Rex can change shape into a space ship or a Decepticon city! The Transformers battle explodes into uncharted territory when the Titans Return! To control an ancient race of giant, city-sized warriors- Titans - the Autobots and Decepticons must harness the power of Titan Masters, smaller bots that give bigger bots enhanced abilities in battle. The ultimate Decepticon weapon is joining the Titans Return battle! Imagine TRYPTICON will destroy everything and devour everyone in his path. 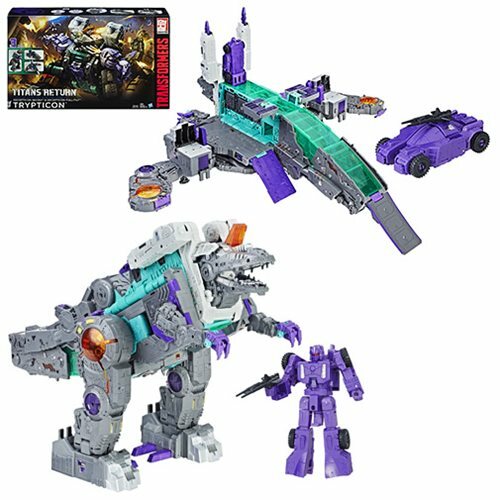 The Titan Class Trypticon figure is the largest figure in the 2017 Titans Return universe. The towering T-Rex converts between 3 different modes: dino, spaceship, and city. When the figure is in city mode, it connects to Titans Return Leader Class figures (each sold separately) to form the giant Nemesis Command! When the figure is in T-Rex mode, it can "eat" Titan Masters figures: Trypticon can chomp them down, then kids can open his stomach to get them out. Comes with a Deluxe Class Full-Tilt figure and a Titan Master Decepticon Necro figure. Additional Titan Master figures are each sold separately, but with so many to collect, the Titans Return battlefield is a veritable all-you-can-eat bot buffet for Trypticon. Full-Tilt figure attaches to the Trypticon figure's chest. Titan Master figure becomes the head for the Full-Tilt figure and works with Titans Return Deluxe, Voyager, and Leader Class figures (each sold separately). Also features a storage compartment in the figure's tail. Ages 8 and up.